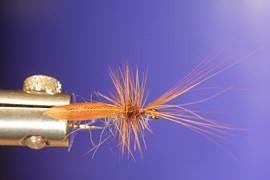 Fly tying instruction Simple Dry Fly. 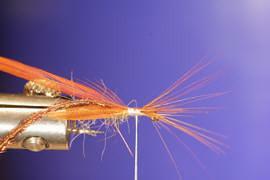 This technique - almost forgotten these days - lets you use larger hackles that most tiers never use, unless they tie lots of streamers. Without it, almost two thirds of the hackles in a normal cape go to waste. 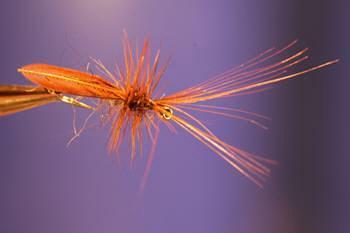 A very nice side effect is that you produce a fly that imitates natural flies really well. 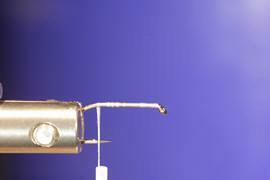 1) Clamp the hook correctly, depending on your vise. 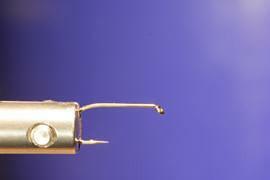 When using a Norvise like the one on this photograph, take care to align the hook properly. 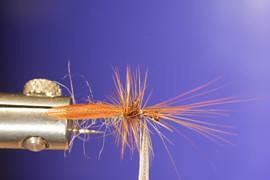 2) Tie on your thread and tie nice tight touching turns from the eye all the way to the beginning of the hook´s bend. 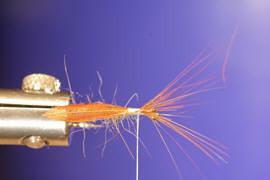 This will contribute to the quality and the durability of your fly. 3) Dub sparsely about two thirds of the hook from the bend towards the eye. You may use brown, grey, or olive dubbing. 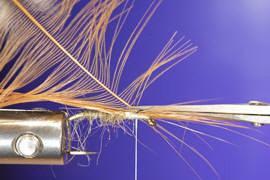 4) Pick a large hackle from the rear end of your cape. 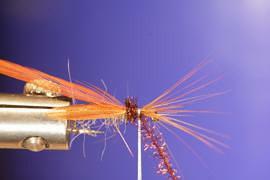 Any color can be used, natural hackles are better than dyed ones. 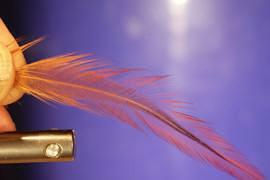 5) Now stroke the fibers against their natural direction, taking care not to strip them from the quill!!! 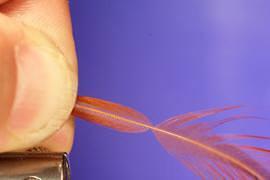 7) Now pull back the front end of your quill and snip it off as close to the hook as possible. This will leave a few fibers pointing forward which will serve as antennae. Next, snip off the back end at the "rounded" part, taking care not to cut any of the fibers pointing forward, needed to form the rounded part. 8) Secure the entire structure with a few turns against slipping. A knot is not necessary and would only add useless weight. 11) ...and then your hackle forward towards the eye.. 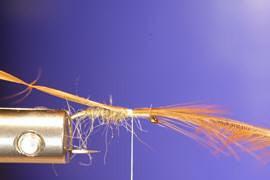 Tie down and snip off hackle and herl. A few words about using permanent markers. No matter which make, solvents are always included in these markers. 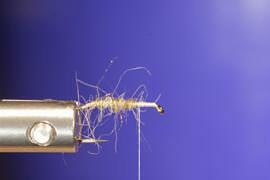 If, after coloring your thread, the head knot is done quickly, the use of head cement at the knot is not necessary. The solvents evaporate and leave behind only the dye or pigment. This will suffice to stabilize your whipfinish.